But young stand thinning or YST (also called pre-commercial thinning or PCT) seems to have fallen out of common practice lately. It has come to be seen (mistakenly, I think) as an avoidable expense rather than an important investment in the stand. An investment that begins to shape how the stand will look and behave in the future and which adds resilience and options to the landowners’ woodland portfolio. The idea of YST is to avoid harmful overcrowding later by removing excess trees early on. YST lets the remaining “leave trees” grow faster and larger before serious crowding sets in. This means that trees reach a usable size sooner, and hopefully allows the very important first thinning harvest (also called a commercial thinning) to be done “on time” when the stand is in its 20’s. This first thinning harvest is costly and the difference between it being another big expense for the landowner rather than breaking even or even paying some small profit, often comes down to the size of the trees harvested. YST is meant to ensure that the very important first thinning harvest can pay for itself. 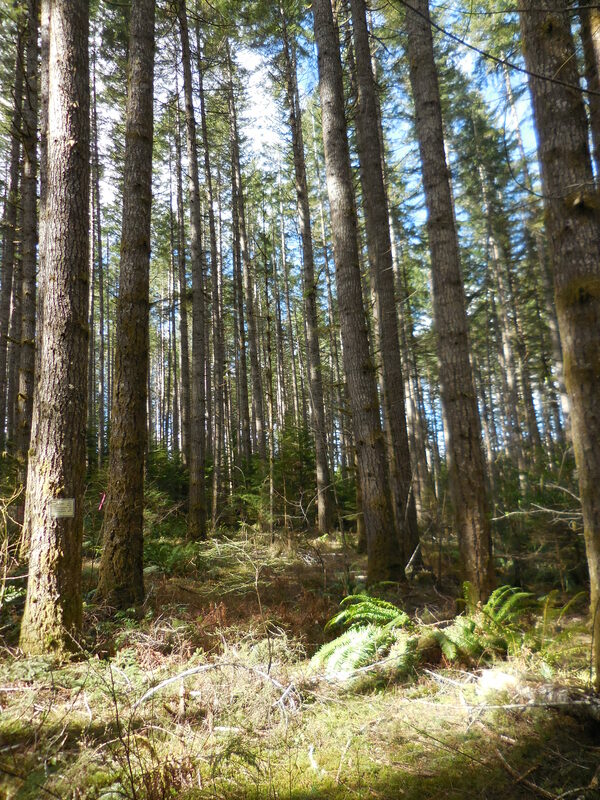 Ideally, young Douglas-fir stands in Western Oregon should be thinned when the dominant trees are about 15 feet tall, or about 10 years old around here. Yikes, that seems early. Frankly I don’t know many people who are thrilled about thinning trees they just barely got established and free to grow. People are looking forward to the trees’ shade suppressing hated weeds like blackberries and broom and are inclined to postpone YST until the weeds decline and the stand begins to “look crowded”. Avoid this temptation. Why thin so early? Even by the time trees are 15 feet, you can often already begin to distinguish the good trees from the bad. The trees are past browse and should be beating the weeds. Once that has happened, the sooner you remove the extras and limit competition among trees, the stronger the beneficial effects and the less the costs of the YST will be. Yes, it may be possible to delay until trees are 30 feet tall, but waiting until crowns begin to compete heavily means a loss of some growth that you would rather have on your “leave trees”. Also by the time trees look crowded to many people, it is getting very late. Referring to the illustrations of the previous article, the recommended timing of a YST is meant to occur well down in the uncrowded green zone, well before competition gets going in the Goldilocks zone. The YST is meant to shift your stand from the right-hand column to the left-hand column or a little beyond, with fewer trees, more room and new growth potential until it is time to you your first thinning harvest. An earlier YST also means it can be done more efficiently and cheaply. Small trees can be felled much more quickly with less slash building up. There is little concern about stand stability, or delayed growth response when trees are thinned early. My point is that if an area was planted at a 10×10 spacing (440 tpa) and had good survival, the stand will get too crowded before the trees are big enough for a thinning harvest. If that is the case, it should be thinned down to at least 300 tpa, meaning you may need to remove a quarter to a third of the trees (110 to 145 tpa). This is a lot of work, even when trees are small, which takes us to some good advice for many family forest landowners: “Thin early and thin often”. I give some strategies for thinning in the next article of this series. I have an acre of mainly doug fir and it is planted too close. What is the rule of thumb for spacing? I need to thin and need to know how much. They range in diameter from 4″ to 14″ and are up to 85″ tall. One of the Yamhill people came out a few years ago but I have forgotten the spacing distance. Thanks. Dave with such a range in diameters it sounds like your stand may be starting to self-thin. You may have missed the opportunity to thin proactively, though I couldn’t say definitively without seeing it. Looking at the crowns in this case is key. If the larger trees have robust, deep crowns, and the smaller trees have puny crowns, then the stand is taking care of itself. In this case removing the smaller trees will reduce fire hazard, a worthy endeavor in itself, but have little impact on the larger trees. 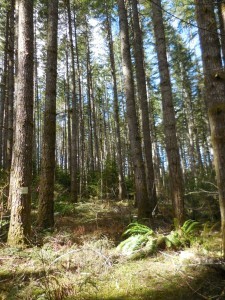 See the graphs in Brad’s previous post for some further guidance: http://blogs.oregonstate.edu/treetopics/2016/01/29/spacing-young-conifer-stands-2/. Take some measurements – average diameter and average spacing – and compare to his bar graphs. Hope that helps.